Whether you're live streaming your internal meetings or external communications, it's important to ensure your content is protected. IBM Video Streaming provides industry leading security features to make sure content stays under your control. Add a custom logo to your player to deter attempts to capture and re-publish your content. Navigate to the Branding tab by clicking Dashboard>Channels>Channel Name>Player settings. You can then choose 'Settings' next to the Player branding option. Here you can select which type of branding you would like for your content. 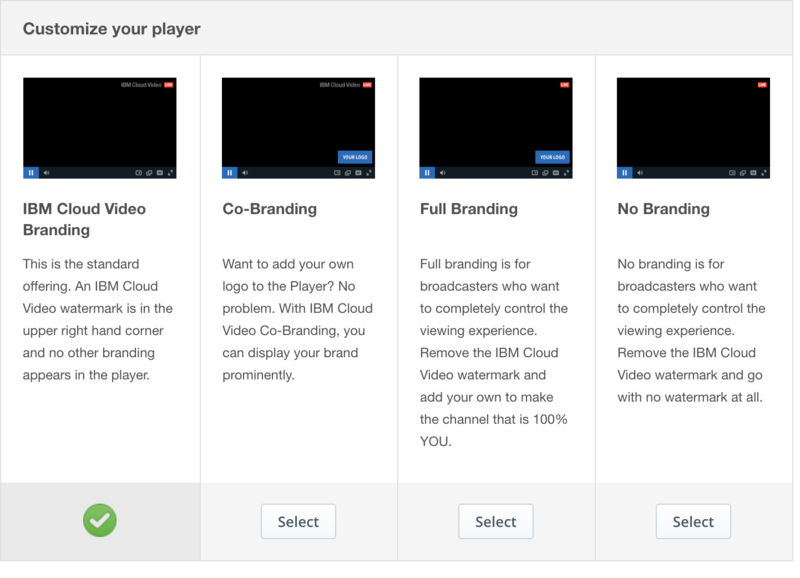 Co-Branding will allow you to have both your personal logo as well as the IBM branding on the bottom of the video player. Full Branding (Platinum and Streaming Manager) allows you to include JUST your logo, without any IBM branding on the player. No Branding (Platinum and Streaming Manager) will not display a logo OR the IBM branding on the player. When uploading your logo, you must follow the correct size ratios. The maximum size of the image you can upload is 288x96 pixels, however we recommend a size of ~40 pixels for the best user experience. Social sharing allows viewers to easily share your channels content on their own social media sites, including Facebook and Twitter. This function appears in the video player under the icon "Share". 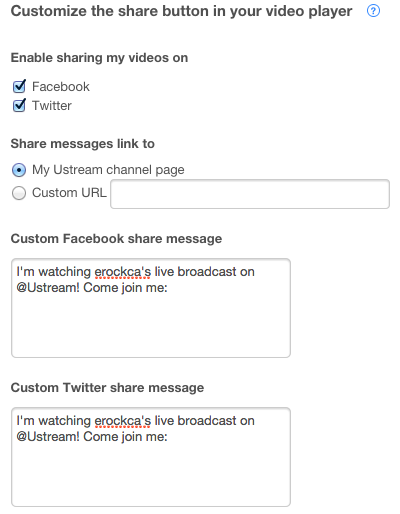 Selecting Facebook and Twitter will give you two custom share message boxes. The information you insert here will appear in the descriptions of the Facebook post or Twitter message. To remove the "Share" button from your video player, simply uncheck the box "Enable social sharing from this channel". For a full white-label solution, embed the player on your own webpage and hide your IBM Video Streaming channel page. Removing your channel page makes it inaccessible to users and removes it from IBM Video Streaming search results. For maximum security, all access control features are available in IBM embeds. This feature is also required when monitoring your content using a third party paywall like Cleeng. For more information on how to set up a PPV paywall on your IBM Video Streaming content, please see the article here. To hide your channel on your Channel page, select your Channel, then Security. Then toggle the option next to the Hide Channel option to On. Channels can be embedded anywhere on the internet, but you can restrict embedding to specific URLs using the Domain Restriction tool. This option can also be found under Security. This tool allows you to exclusively feature your embedded channel only on sites you specify. If your channel or content is embedded on a URL other than the one you've specified, you can choose where the link will be directed to using this tool; your channel or another URL. 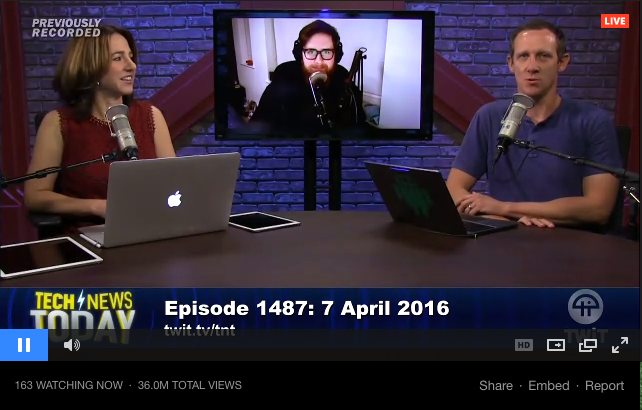 Worried about content rights? Geo-blocking limits viewing to geographic regions of your choosing. Define countries where your content can and can't be accessed. IBM Video Streaming can provide additional privacy content restrictions including ip blocking. For more on how to use Geographic Filtering, please see this article. Streaming Manager and Streaming Manager for Enterprise clients can reach out to their Customer Success Manager or submit a Support Ticket to enable specific Geo or IP Blocking for their accounts/channels.